*Note* Where possible, we have linked to Pam's reviews for her picks. Many of those reviews ran in Scene Magazine, so most of the links will take you to their website. Time it is again to round up our favorite films of the year just ended, an exercise that leaves me once again surprised that so few films stood out as exceptional. The films I like are not the same ones that get the usual accolades, since I avoid “big” movies, fantasy, most violence, animation and elaborate costume dramas. I prefer smaller domestically made films, often the kind that get either overlooked or unjustifiably panned by critics. I continually wonder why a thoughtful, modest picture like SEEKING A FRIEND FOR THE END OF THE WORLD or JEFF, WHO LIVES AT HOME, for example, incites such hostility from some reviewers. It's a matter of taste, I guess, but I also think consensus (aka “groupthink”) gathers around certain prestige name brands (Spielberg, Daniel Day-Lewis, for instance) and pretentious, self-important items like THE MASTER. Here are some films I especially enjoyed in 2012. Including more titles would, I'm afraid, be a stretch. Comedies were mostly unmemorable in 2012, maybe because there's so little to laugh about in these times. Anglo-Irish playwright and filmmaker Martin McDonagh's wickedly funny, bloody action comedy centering on a Shih Tzu stolen from a mad gangster, was a revelation, with a brilliant cast (Colin Farell, Woody Harrelson, Sam Rockwell, Christopher Walken) and sharp, clever writing. Looser and less jewel-like than McDonough's nearly perfect IN BRUGES, it was still the funniest film of the year, and of course, it faded without notice. The documentary-like texture and painstakingly accurate period details (down to the '70s hairstyles and eyeglasses) made Ben Affleck's heart-thumping drama about a Hollywood-based ruse enacted to save a group of hostages from Iran in 1979 one of the year's best films. While certain elements of the story were invented or exaggerated for the sake of entertainment (there was no chase down the airport runway, for example), the film largely avoided American jingoism, providing an objective narrative introduction about Iran's history with the U.S. that commendably included this country's engineering of the overthrow of Iran's democratically elected president Mohammed Mossadegh in 1953. One of the rare films to make truly good use of 3D was Ang Lee's adaptation of Yann Martel's best-selling novel about an Indian adolescent boy who finds himself the sole human survivor of a ship disaster that has killed his family. He's cast adrift in a lifeboat with a hungry Bengal tiger, a refugee from Pi's father's zoo. Despite running a bit long in the middle section, the film, using a largely unknown cast, gracefully handles the story's philosophical components and tricky back-and-forth narrative structure. I have a penchant for mournful, philosophical black comedies like this, another that was barely noticed in 2012. Steve Carell plays an insurance man facing the imminent apocalypse, who finds himself on a road quest with his pretty, calamitous neighbor, played by Keira Knightley. Lorene Scafaria's film maintains a pleasantly sardonic tone while finding hope in the face of imminent annihilation. Lauren Greenfield plugged into the zeitgeist of the Occupy movement accidentally; she was making a documentary about billionaire developer David Siegel and his wife Jackie, who were building the country's largest and most expensive home. During the making of the film, the real estate bubble burst and the wealthy family found themselves utterly at sea, trying to tighten their belts, cut back on atheir lavish lifestyle and sell the obscene Xanadu-like estate. The film is a surprising character study, humanizing rather than lampooning its wealthy subjects while also illustrating the mechanics of capitalist greed. Its likeable spokeswoman, Jackie, a former beauty queen turned pampered trophy wife and mother of a huge brood, is refreshingly candid, handling her challenges and increasingly indifferent husband with self-aware humor. David O. Russell's breathless, vertiginous style was an asset to this eccentric comedy-drama based on Matthew Quick's novel about a former teacher determined to reunite with his estranged wife after spending time in a mental institution. Brad Cooper showed his increasing depth as troubled protagonist Pat, Jennifer Lawrence was pure quicksilver as the improbably named Tiffany, a fellow outcast who sets her sights on Pat. How is it that a movie that climaxes with a silly dance competition emerged as one of the year's best? As I always say, it's the writing, stupid; Russell's rapid-fire screenplay is first-rate. The film also featured the first comedy role in years — Pat's Philadelphia Phillies-crazy dad — worthy of Robert De Niro. 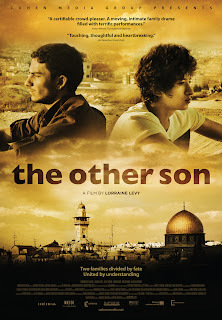 Two films, a drama and a documentary, that address the Israel-Palestine conflict with insight and sensitivity. THE OTHER SON, Lorraine Levy's story about a Tel Aviv family who discover that their teenage son was switched at birth with the son of a Palestinian family, explores the artificial barriers created by the apartheid-like system and the everyday humiliations (checkpoints, lack of access to health care) experienced by Palestinians. In the sobering documentary 5 BROKEN CAMERAS, Emad Burnat, resident of the Palestinian village of Bil'in, buys a video camera to record his newborn son. He begins documenting his village's nonviolent protests against the building of a separation wall by Israelis. Over five years, five cameras are successively shot or smashed by Israeli military. His wife begs him to stop filming, but Burnat bravely continues to record, capturing a series of frightening night raids and daily arrests. Glad to see 'Queen of Versaille' made someone's list. I liked that one a lot more than I expected to, and I think it really gives some insight into the mentality of the super rich and the strange sort of bubble world they live in. Hubby seems like he'd be an a-hole money or not, but the "Queen" struck me as being basically a likeable person, not stupid but just ignorant of the world outside her own. Also loved 'Argo', and wish I had seen 'Seven Psychopaths' and 'Seeking a Friend'. As for your comment about some critics hating movies like 'Seeking' and 'Jeff Lives at Home', although I didn't hate 'Jeff', I didn't love it. For me, movies like that one create a phenomenon not unlike the "uncanny valley" in computer animation. What I mean by that is that on the one hand they want to come across as realistic and relateable, but on the other hand the style of comedy they employ tends to feel a bit sitcom-y to me. I prefer my comedies to either be a little more grounded or else go completely over the edge into slapstick and/or absurdity. Like you say, a matter of taste. Still, of all the "stoner relative who turns out to be the wisest one in the family" movies that have come out recently, I think 'Jeff' was the best.